Hispanic Catholics mark 10 years of heritage Mass in Phila. The parish center at Holy Innocents Church, Philadelphia, was buzzing with excitement on Saturday, Aug. 29 as participants arrived for the beginning of a day of reflection and celebration. This year marked the 10th anniversary of the Hispanic Heritage Mass in the Archdiocese of Philadelphia. In preparation for Pope Francis’ historic visit to Philadelphia (Sept. 27), the day began with two sessions focusing on the family and mercy. Father Domingo Rodriguez Zambrana, S.T., of the Missionary Servants of the Most Holy Trinity, was the keynote presenter for the morning reflection. For more than 25 years Father Rodriguez has served the Hispanic community throughout the nation as a renowned homilist and speaker. About 600 attendees from Avondale to South Philadelphia to Bensalem and other communities in the region showcased their Hispanic heritage. The parish center was decorated with the flags of all the Spanish-speaking countries represented in the archdiocese, with the official image of the Holy Family for the World Meeting of Families as the focal point. The day of reflection was followed by the Hispanic Heritage Mass in Holy Innocents Church. 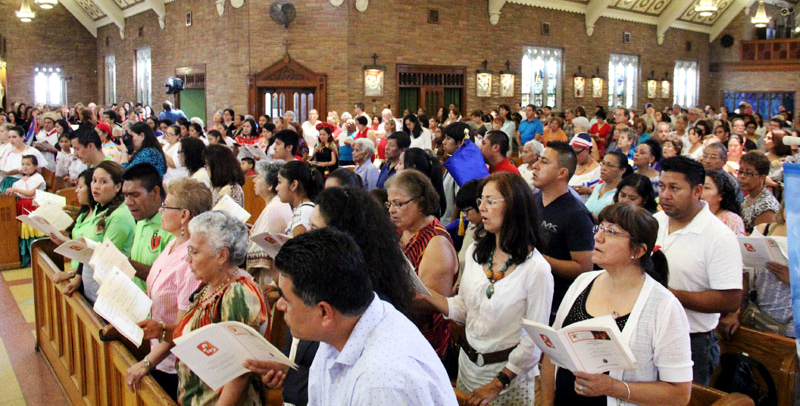 Each year Hispanic Catholics in the Philadelphia Archdiocese celebrate their rich heritage with a Mass during the month of October, which is Hispanic Heritage Month. Since the first Mass in 2005 at the Cathedral Basilica of SS. Peter and Paul, the faithful gather every year without fail. 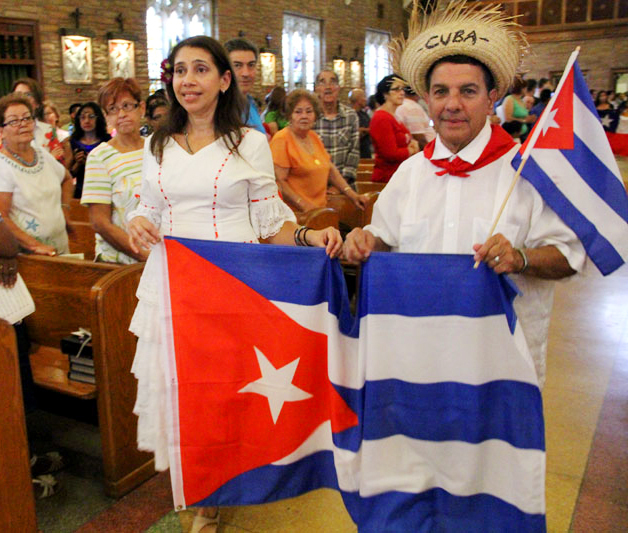 This year’s Mass at Holy Innocents in the Juniata Park section of the city began with a grand procession including banners bearing the flags from each Spanish-speaking country, followed closely by the name of each parish in the archdiocese. With Mary as the patroness of these countries, the procession can be seen as a visible prayer that the Mother of God leads and watches over the peoples from each nation. Redemptorist Father Bruce Lewandowski, vicar for the archdiocesan Office of Cultural Ministries, encouraged everyone to express this unity with a warm welcome to Pope Francis. Since the pope knows well the warmth of a Hispanic welcome from his time in Buenos Aires, Argentina, he will likely not be disappointed by his welcome in Philadelphia later this month. Thank you for the beautiful news about the Hispanic Heritage Mass. I was unable to participate by my presence but you were all in my prayers. Of course, I was very proud that Fr. Domingo Rodriguez, ST was the keynote presenter. Fr. Domingo is a member of my religious family, as well as a special friend of mine. You were all blessed that day to be so well prepared for the visit of Our Holy Father, Pope Francis. I look forward to reading more good news especially about the Hispanic/Latino community on fire living the New Evangilization in word and deed.